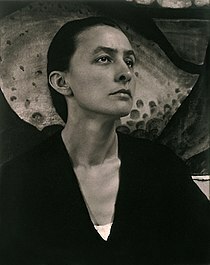 On the brink of the Depression in 1929, Georgia O'Keeffe - America's first great modernist painter - headed west. In the bright light of the New Mexico desert, she forged an independent life and found the solitude she needed for her truly original art. The photographs taken of her by her older lover scandalised the public. Her flower forms were seen as a shocking and vibrant display of femininity, her bones and skulls as surreal and disturbing. Now, 30 years after her death, to coincide with a major Tate Modern show, imagine... tells the story of Georgia O'Keeffe, one of the most inspiring artists ever. Tres fragmentos de 15 minutos aprox, con el texto de los subtítulos en inglés que hay que traducir ¿quien se anima? ¿alguien quiere ayudar con el segundo? alguien más que ayude con un tercer fragmento de 15 minutos aprox? Ahí van los subs de la parte 2! sólo queda un fragmento más de 15 minutos ¿quién quiere ayudar? Acá va la tercera parte de Georgia, perdón por la demora, fue un fin de año infernal!